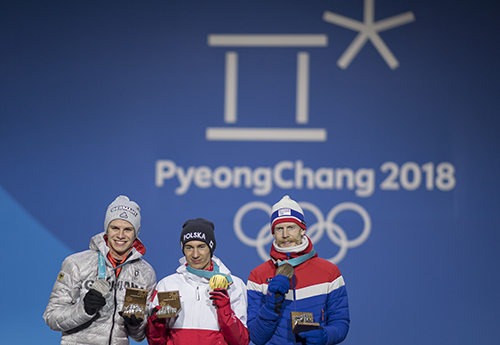 Kamil Stoch of Poland took the third Olympic gold medal of his career on Saturday evening in PyeongChang. In a dramatic competition, Stoch jumped on 135 m and 136.5 m (285.7 points) and came in ahead of Germany's Andreas Wellinger (135.5 m and 142 m; 282.3 points) and Norwegian Robert Johansson (137.5 m and 134.5 m; 275.3 points). Stoch was overwhelmed after he defended his title: "It's unbelievable, I can't describe this feeling right now. It feels like I'm still dreaming, but this is a beautiful dream so I don't want to wake up. I knew that I didn't show everything that I can so far, so I just wanted to make my best jumps here and I think I did it." Stoch was already in the lead after the first round and proved his strong nerves in the final round when Andreas Wellinger increased the pressure on him with an amazing jump of 142 m. With all his experience, veteran Stoch then showed his skills again and took a well-deserved win. For Andreas Wellinger this second place earned him his second medal after he won the gold on the normal hill a week ago. "It was a great competition on a really high level. I'm really happy that I can be at the Flower Ceremony again. It's crazy to come to the Olympic Games and win gold and silver in the individual competitions. It's unbelievable and I think I'll need a few more weeks to realize it", said Wellinger. The third place went to Norway's Robert Johansson, who already took his second bronze medal at this Olympic Games. "I felt great ever since I got here and my jumping was very stable. I have been working incredibly hard for many, many years for successes like these. It's hard to describe my feelings because I have been dreaming of this since I was a little kid and now it finally happened." Ski Flying World Champion Daniel Andre Tande of Norway presented himself in a strong shape again, but only in his second jump, the best jump of the second round. In 15th, Tande was already too far behind in the first round and so he could move up to fourth overall with this great second jump, but he came in 2.2 points behind the podium. He was followed by Johann Andre Forfang in fifth, Andreas Stjernen was the fourth best Norwegian in eighth. It will definitely be extremely difficult to beat the Norwegians in Monday's team event, that's for sure. Austria's Michael Hayboeck surprised in second after the first half of the competition with a great 140 m jump. 131 m were then not enough in the final, Hayboeck fell back to sixth. This is a very good result, but considering that the medal was within reach for him it was a disappointment. Also because this was probably the last chance for the Austrian ski jumpers to win a medal at this Olympic Games. Karl Geiger justified the trust placed in him with a strong seventh place. "I'm super satisfied, the second jump was really good and I'm also extremely happy for Andreas Wellinger", said Geiger. Richard Freitag achieved a Top 10 finish in ninth and was actually performing better than this result shows. Freitag didn't have good wind conditions, especially in the second round. Markus Eisenbichler completed the strong team performance of the Germans in 14th. Head coach Werner Schuster was satisfied with the results of his athletes: "This was a very fair event on a high level. I'm very satisfied with this competition. We are very happy and Kamil is the well-deserved winner, he had two really good jumps today. Now we are looking forward to the team event on Monday and there we want to show a really good performance again." Dawid Kubacki (POL), Peter Prevc (SLO) and Japan's Ryoyu Kobayashi all scored 258 points and tied for tenth. US American Kevin Bickner could show a strong performance again, the 21-year-old came in 20th. Remarkable was also the 21st place for Canada's Mackenzie Boyd-Clowes. Italy's Alex Insam did a very good job as well and came in 23rd. Insam's teammate Davide Bresadola had some bad luck today. He crashed and at first, it seemed that he didn't suffer any injuries, but when he took off his suit he noticed that the zipper of the suit had caused a deep cut to his forearm. The 29-year-old was taken to the hospital to stitch it up. The next and final Ski Jumping event of the Olympic Games will be the team competition on Monday at 9:30 pm (1:30 pm CET).